Poet. Also known under the pen-name 'Bysshe Vanolis' (or 'B.V.'). 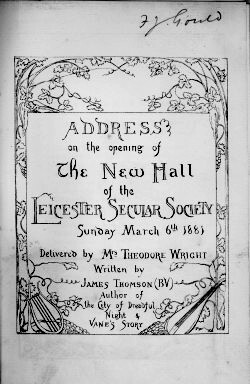 He wrote a poem 'Address' for the opening of Leicester's Secular Hall in 1881, which was recited by the actress Mrs Theodore Wright, as stated in this poster. No other test of valid worth we find. Some compound gas, or dog with brain laid bare. Than honest work to make the best of this? Waste adds to waste as store increaseth store. How can he love a dim dream deified? Soothing despair itself with some relief. All good, though varying in every case. Of help and produce in our social range. Which we now open; may it bear good fruit! In simple womanhood and manhood's name! Trench not on any other's equal right. Our creed is simple, All men are one man! Our sole commandment, Do what good you can. Inviting the assays of other men. Some books, our true "Communion of the Saints,"
As makes a blessing, not a curse, of leisure! Shall make the sweet hours blithely dance along. This Sunday, March sixth, Eighteen eighty-one. Did you spot the reference to four of the five busts that adorn our Hall? I find alone Necessity Supreme. Not to be confused with the earlier poets who lived 1700-1748 and 1763-1832, nor with many others of the same name. Poetry Works gives text of 43 poems. Poetry Works gives text of 18 poems. James Thomson on Project Gutenberg. Critical appreciation of his poems. Tom Leonard, biographer of James Thomson. Extract from Tom Leonard's Places of the Mind ... (pdf, 83kb).